Have you ever noticed Donald Trump’s mouth? The Donald has many distinctive features. However, I would argue that it’s not his hair, or his bloviating manner, or his bad taste, or his truly execrable opinions that stand out the most. No, it’s his mouth. Donald Trump’s mouth is the secret heart of Donald Trump, the persona—the wellspring, if you will. The source of his most famous catchphrase, after all! 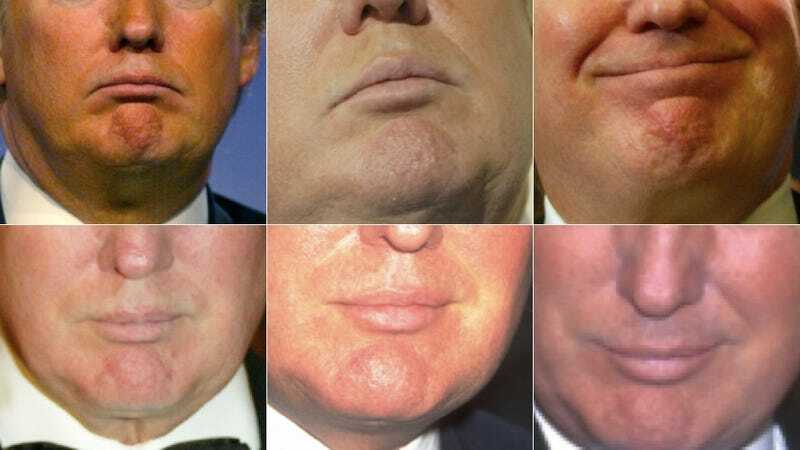 Trump’s mouth does just a few basic things—it smiles smugly, it smiles more smugly, and most famously of all, it pouts. (To indicate that he is thinking very hard and seriously. Presidentially, even.) As the years have worn on, Donald Trump’s mouth—much like his reputation—has hardened into caricature. Allow me to demonstrate! Lead illustration composed of photos via Getty; next six images via AP; remaining images via Getty.